Discussion in 'iPhone' started by ABC5S, Oct 13, 2013. Anyone remember when Apple sold the unlocked iphone 5 after the initial release last year to gauge when the iphone 5S unlocked will be sold by Apple. Yes, but I'm waiting for Apple to unlock the AT&T version, but please do not ask me why. They already sell the unlocked one. It's the one that comes with a tmobile sim. Does this make sense ? Don't laugh. I mean I really, really do not want to go to the Apple Store, but to do it right online. I believe it's usually a month or two before the unlocked, sim free iPhone is released--if that's what you mean. The sim free 5C is already out. Why don't you purchase the T-Mobile one? It's exactly the same as the ATT model, but unlocked if purchased through Apple. Just buy the T-Mobile version. It is 100% the same as the AT&T version is if you unlock it. If you buy it from Apple(.com or store) it's unlocked, just don't buy it at a T-Mobile store. I bought mine from Apple.com on release day and just dropped in my AT&T sim without any issue. Edit: wait a minute .... are you saying you want too use it on Verizon? AT&T/T-Mo version won't work whether it is locked or unlocked on VZW. Order the T-Mobile version from the Apple online store. It is unlocked. Not necessarily true, please see this handy chart from this great thread by Satnam. from what i know, unlocked iphones are for GSM models only. You are mistaken. 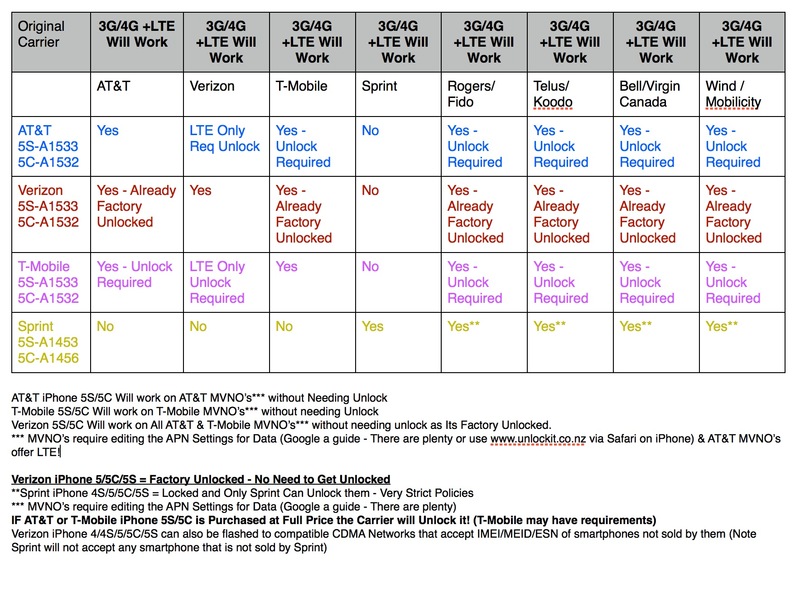 The Verizon iPhone 5s unlocked is the MOST UNLOCKED 5s. It works on every GSM LTE/3G/Edge Band on Earth as well as Verizon in the US. It will work with AT&T, T-Mobile and Verizon SIM for $649. The AT&T, Verizon, and T-Mobile version are all the same model. Except Verizon will not activate a phone not purchased for their network. So they will not add it to your account. You OBVIOUSLY did not understand my post. The T-Mobile version ordered from the Apple website IS UNLOCKED! The AT&T and T-Mobile iPhones are the exact same model. They work fully on both networks. If you buy the T-Mobile version from the Apple website it will work with any GSM carrier including AT&T. There is no reason for you to wait. Order it and use it with your AT&T SIM. They say in this site that if you buy an att iphone for the full price when you connect it to your computer after making a restore it is also going to be unlocked. Buy phone, find and purchase SIM, Cancel t-mobil voice/data plan and that's it ? ABC5S said he wanted to order from the apple website not buy it device only in store. That means his option is the T-Mobile version which is sold unlocked on Apple's site. The T-Mobile version is sold on Apple's website unlocked without a calling plan. There is nothing to cancel. Order the phone, put in your AT&T SIM when it arrives and turn on the phone. You're done. That's all you need to do. If you read the fine print on the T-Mobile version it tells you it's contract free and GSM unlocked. Throw out the T-Mobile SIM provided and use your AT&T SIM. Apple doesn't allow carrier branding on their iphones, so you won't see TMobile (or any carrier) on them. Thanks to the above two posters. Much appreciated.